A moment of reflection at the BuzzFeed RNC party from Gawker's Andy Cush. Gawker staff writer Andy Cush tweeted that his summary of Tuesday night’s “Red, White and Blacklisted” party hosted at the RNC by BuzzFeed was written “just for John Cook.” But we took a peek as well. I’ve spent that [last] year watching the campaign’s forward march and its imperviousness to criticism and basic reporting, first with amusement, then in denial, then in dumb shock, then with hollow resignation to the powerlessness of journalism. So many mindless pundits have attributed Trump’s rise to the failure of the press to cover him adequately, but the press has done hardly anything other than cover him over the last several months. So again, that’s: Denial; Dumb Shock; Hollow Resignation; Powerlessness. 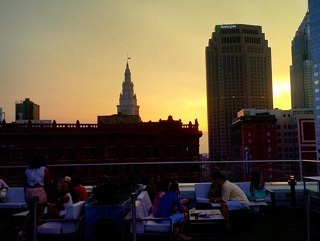 The BuzzFeed party was held at Azure, downtown Cleveland’s largest rooftop bar. That word means a blueish-purple color, which, next to orange, is about the best way also to describe the way the once-Democratic leaning Trump has recolored himself GOP. Read the rest of Cush’s article here.